This dish is so quick and simple you will never get it from the take out store again. You can cut each piece of chicken into nugget sized pieces if you prefer. 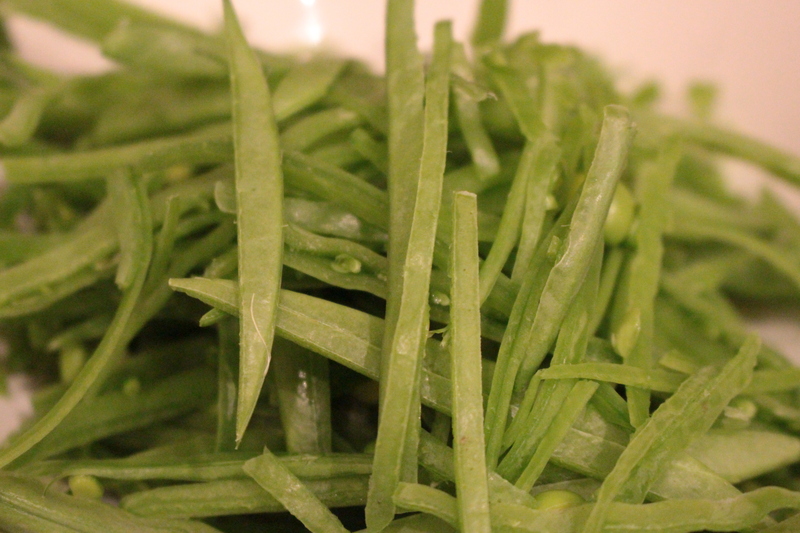 I serve this dish with a big bowl of steamed greens. You could easily serve this dish with a side of rice. The benefit of using cornflour is this dish is gluten free! 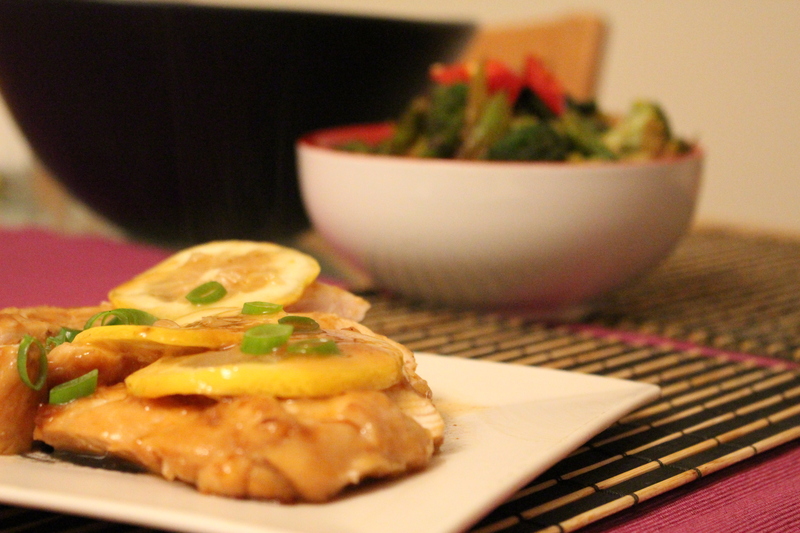 Slice chicken in half horizontally, so you will have 4 thin slices of chicken breast. In a large bowl combine the chicken, sherry, soy sauce and 1/2 teaspoon salt. Mix together, cover and refrigerate. Let marinate for 15 to 20 minutes. In a small bowl, beat together the eggs, 1/4 cup corn-starch and baking powder to form a batter. Remove chicken from marinade and sprinkle with salt and pepper. Dip chicken in the batter to coat. Place chicken into fry pan and fry until golden brown and turn over and repeat for the other side, do this for each piece of chicken breast. In a medium bowl combine the sugar, honey, 1 tablespoon cornstarch, lemon juice and 1 pinch salt, mix together until their are no lumps add stock and lemon slices. 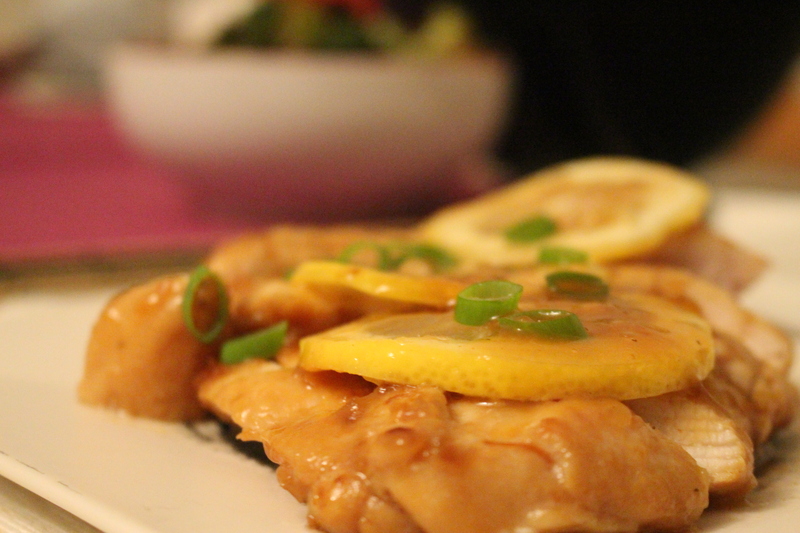 In the fry pan that you cooked the chicken pieces in place lemon sauce, on a medium heat bring the sauce to a gentle simmer. 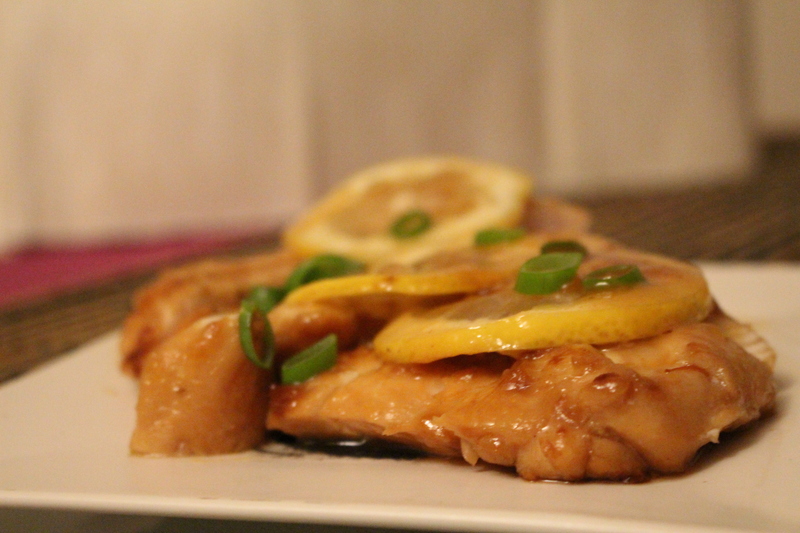 Pour sauce over chicken, sprinkle with shallots and serve. Pre heat combination steam oven to full steam. Cream butter and sugar for 2 minutes, add vanilla bean paste. Lightly whisk egg, add into mixture fold through flour and dried ginger. Spray a 12 hole silicone muffin tray place onto a biscuit tray. 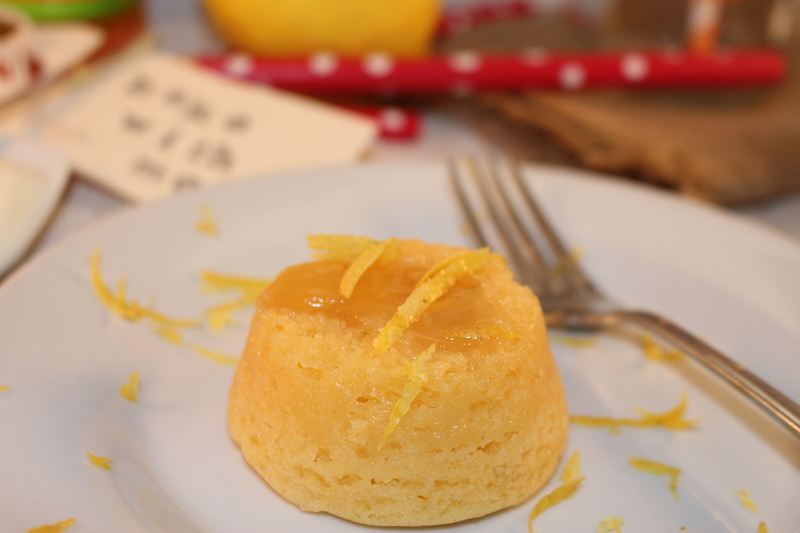 Place 1Tsp of the marmalade at the bottom of each muffin hole. Fold the remaining fruit into the cake mixture. Divide the mixture evenly into the 12 hole muffin pan. Place into oven, cook for 12 minutes. Invert a pudding onto each plate. Serve with cream or ice cream if desired. Would you like to win a Buderim Ginger prize pack? For full details and T&C of the competition! Having invited dinner guests with very short notice, I was confronted with the dilemma of what to cook for them with the minimal time I had. I went into overdrive wondering about what last minute meals I could plan. Of course, whatever I chose would need to knock their socks off. So I headed to my local supermarket and grabbed some fresh seafood and a couple of Five Tastes make at home meals. I wanted to impress my guests and knew the quality and flavours of Five Tastes would help me achieve that. Adding my own creative flair, I added a few bits and pieces to two of the meal packs, the result? The Emperor’s Nasi Goreng with Balmain bug tails and prawns and The King’s Laksa with prawns, scallops and fresh curry leaves. I love incorporating seafood as Sydney has access to the best range of fresh wild caught seafood. 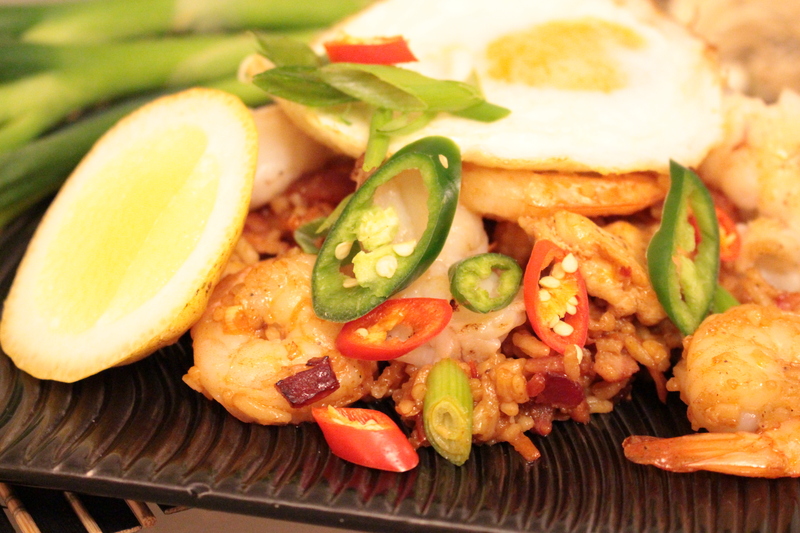 The Nasi Goreng packet serves three, however I used it as an entrée for four people. 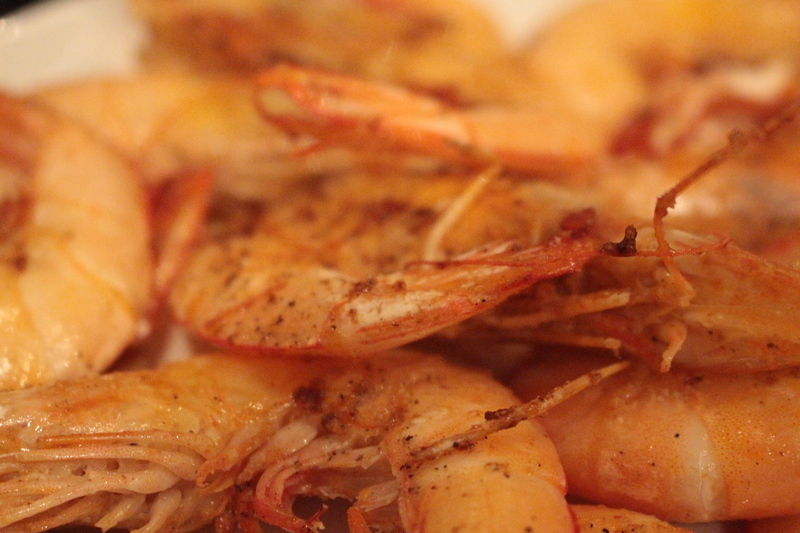 I added 400 grams of Balmain bug tails and 400 grams of prawns as well as an egg for each serving. Simply fry the Balmain bug tails and prawns for 2 minutes each side and with the other meats on the packet instructions. The servings were more than ample. The Emperors Nasi Goreng was unctuous, spicy and gratifying. Given my goal of knocking the socks off my guests, I added some extra red and green chili to the mix and garnished with julienne snow peas. May I say, my mission was certainly accomplished! The Laksa serves four. I added 500 grams of prawns and 300 grams of scallops to the mix. Cook the scallops for 2 minutes each side and add with the prawns as per instructions. 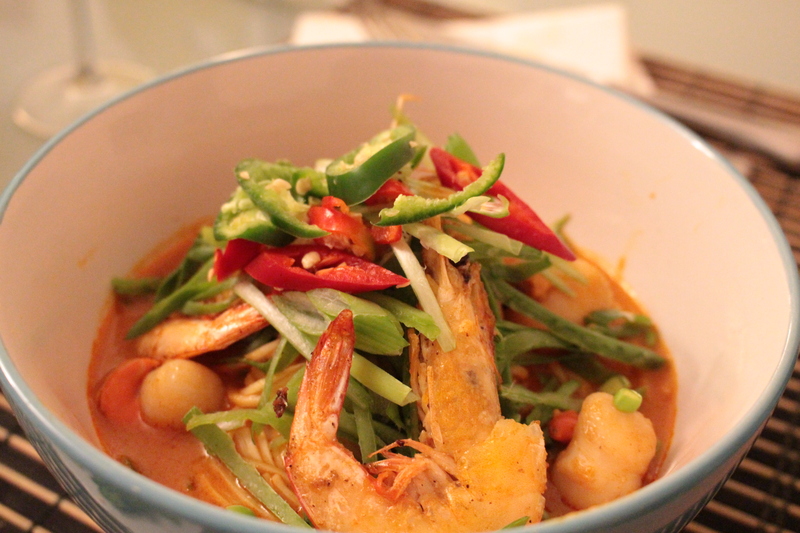 The King’s Laksa was heart warming, satisfying, yet overwhelmingly moreish, the dish was garnished with the prawns, julienne snow peas and extra chilli. The added chili and fresh curry leaves made for a pleasantly piquant dish. Five Tastes meal kits with some fresh ingredients saved me time. My guests didn’t even notice! 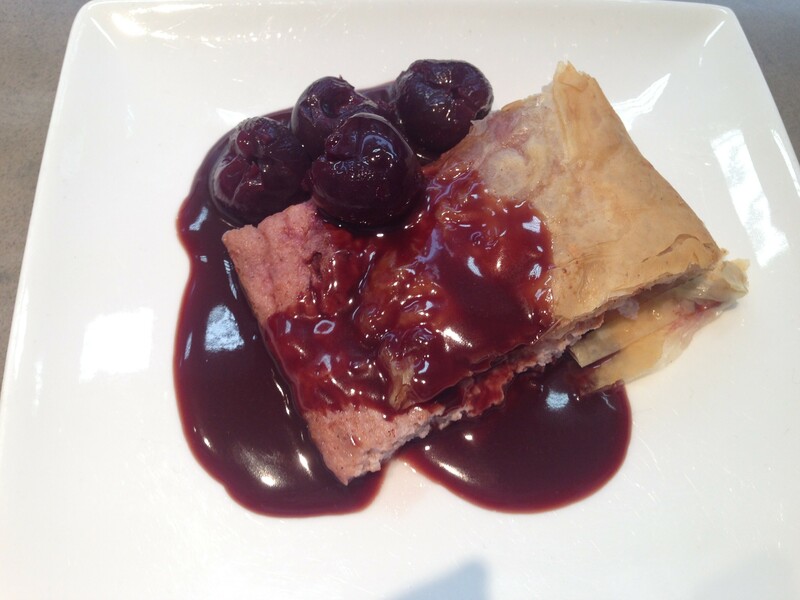 Smooth sweetened ricotta studded with cherries, wrapped up in light and flaky filo pastry, coated in a chocolate cherry sauce each mouthful of this dessert is an exquisite pleasure. Preheat oven to 180C. Line a baking sheet with greaseproof paper, spray with oil spray. In a mixing bowl, combine ricotta, vanilla, cinnamon, sugar and lemon zest, mix well. Add half cherries and stir until combine. Lay a piece pastry horizontal on a clean bench, brush with melted butter, lay another piece of pastry on top, continue with remaining layers of pastry. Form the ricotta mixture into a log. Place on the filo pastry 2cm from the top and 2cm from each side at the end horizontally furthest away from you, press white chocolate melts into the mixture. Fold the pastry towards you and either side across the centre, brush pastry with butter and roll towards you. Place onto baking sheet, brush with butter, bake for 15-18minutes until pastry is golden brown. 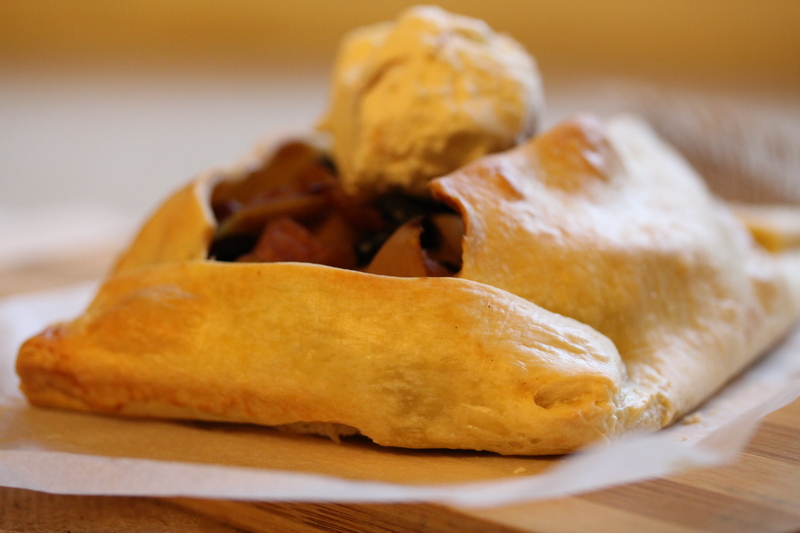 Make the sauce while the strudel is cooking. Place the liquid from the can into a small saucepan, place on a medium heat and allow to simmer and to reduce slightly. Add cream cook for 2minutes; add chocolate keep on cooktop until melted add remaining cherries and take off the heat. 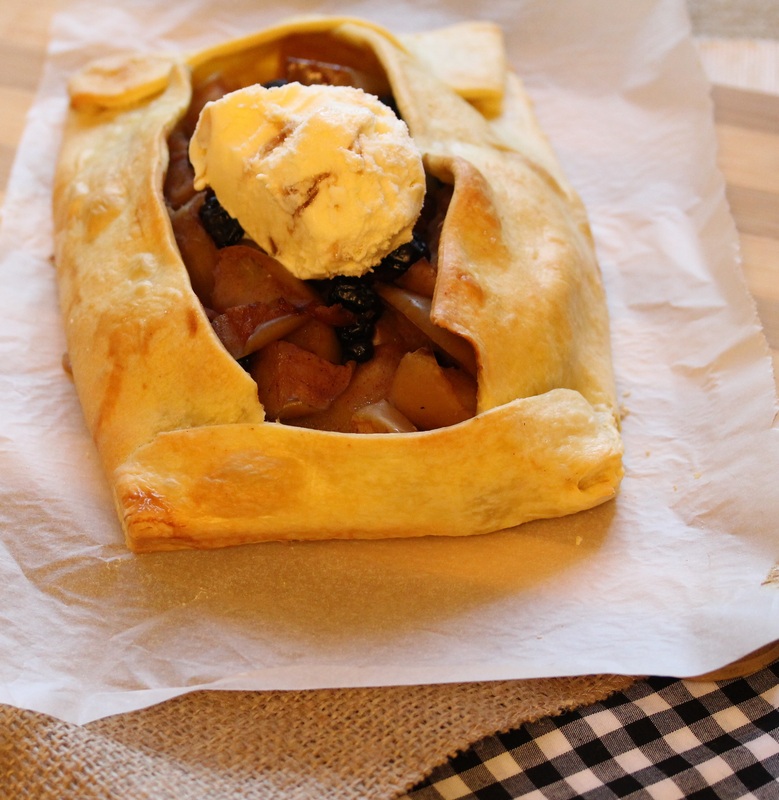 Allow strudel to cook for a few minutes before serving. 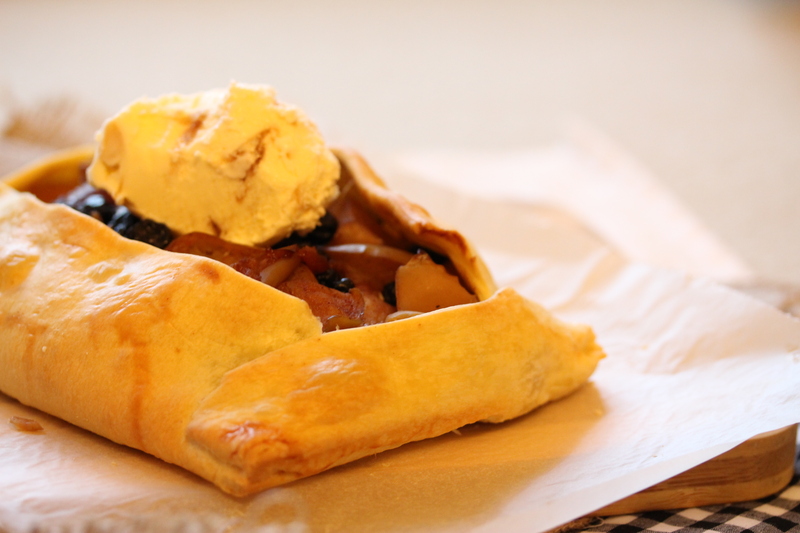 Serve strudel with lashings of sauce and ice cream if you dare. 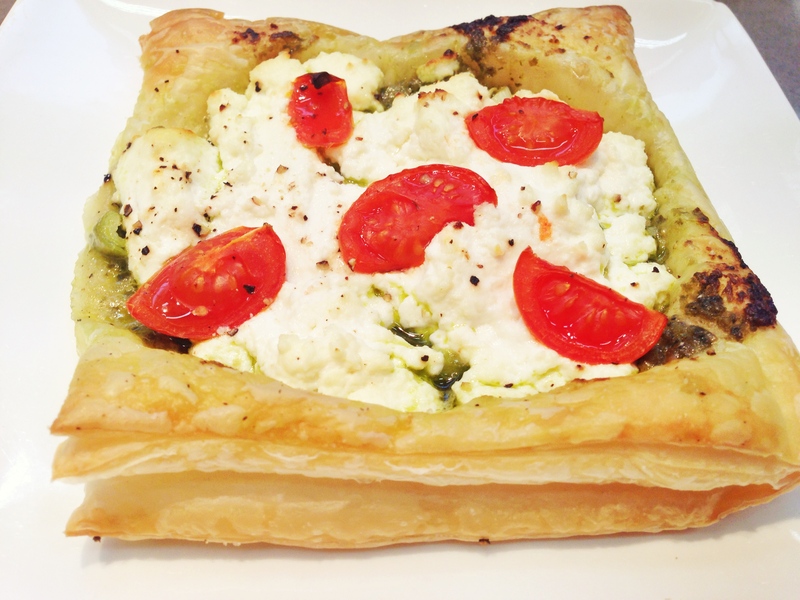 This delicious tart has the velvety smoothness of ricotta cheese, with the crunch of the nuts in the basil pesto, as you cut through the smooth layer of ricotta and pesto you crack the layers of light, fluffy and crunchy puff pastry. Each mouthful has a fabulous combination of flavours and textures, the sharpness of the basil cuts through the creaminess of the ricotta. Adding a little steam to the cooking process creates, light, fluffy and golden pastry. Preheat combination steam oven to 180oC, quarter steam and heat /25% humidity. Line a large baking sheet with baking paper and spray with oil spray.Cut tomatoes into quarters, finely chop shallots. Cut Pastry into 4 even squares, place onto bake sheet. Place 1Tb basil pesto in the centre of each square, spread out leaving a 1cm edge, sprinkle with shallots. Place 3Tb ricotta cheese on each square and spread out leaving a 1cm edge. Scatter cherry tomatoes on top of each tart, sprinkle with salt and pepper. 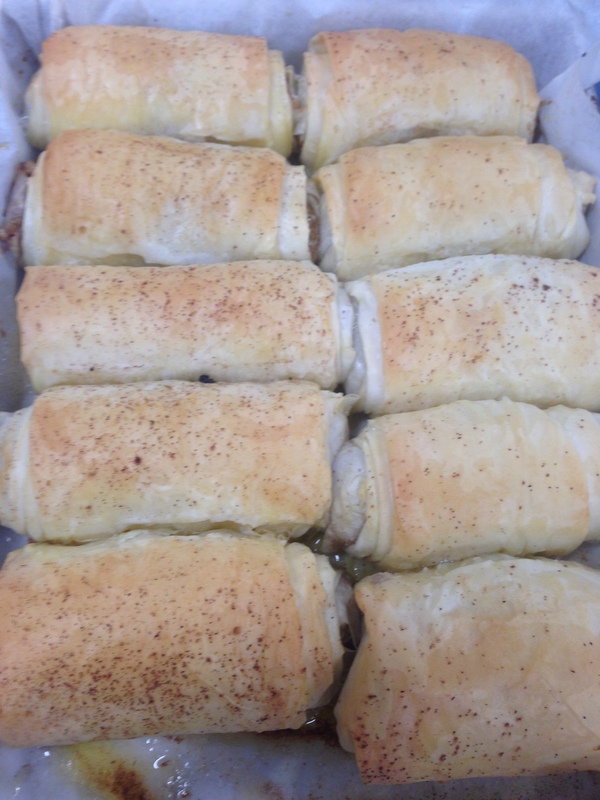 Bake in preheated combination steam oven for 15minutes. Serve with a side salad if desired. This sumptuous desert of sweetened walnuts encased in light and flaky filo pastry, soaked in a sweet honey syrup, is a great companion with a cup of tea. Pre heat oven to 180c, line a tray with baking paper. Place the walnuts, sugar, cinnamon, honey, lemon zest and butter into small bowl of a food processor, and pulse until finely chopped (if you do not have a food processor chop the walnuts as finely as possible with a knife). Remove one sheet of filo and cover the rest to prevent drying out. 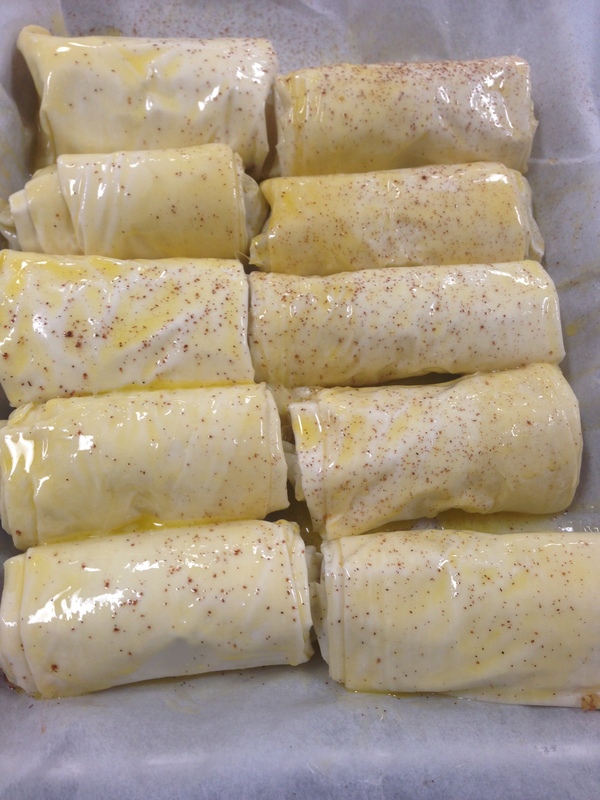 Place the sheet of filo onto workbench and brush with melted butter, place another sheet of pastry on top. Cut sheet into 2 strips for large fingers or 2 strips for smaller fingers. Divide mixture into 10, and shape into a log, it should be 2/3 of the length of the pastry. 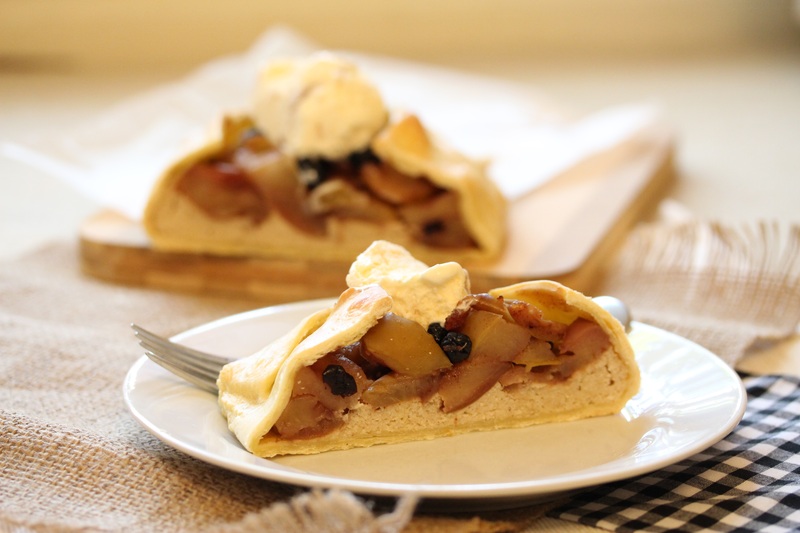 Place a log of mixture in the centre of the pastry. Fold edges over the nut mixture, brush length of pastry with butter roll. Brush top with a little more butter and dust cinnamon over, place onto lined tray and repeat with remaining mixture. To make the syrup, combine the sugar, honey and ½ cup water in a small saucepan. Stir for one minute, allow to reach a boil then reduce temperature to a simmer, simmer for 5 minutes. 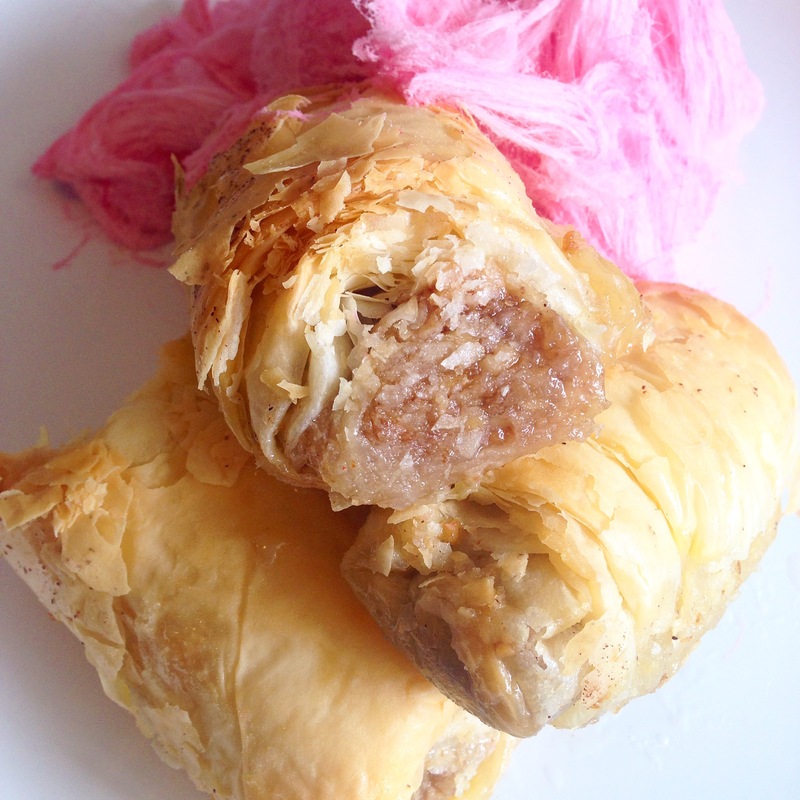 Pour syrup over baklava fingers. Serve fingers individually with Persian fairy floss. This dish is a super healthy and nutritious meal. 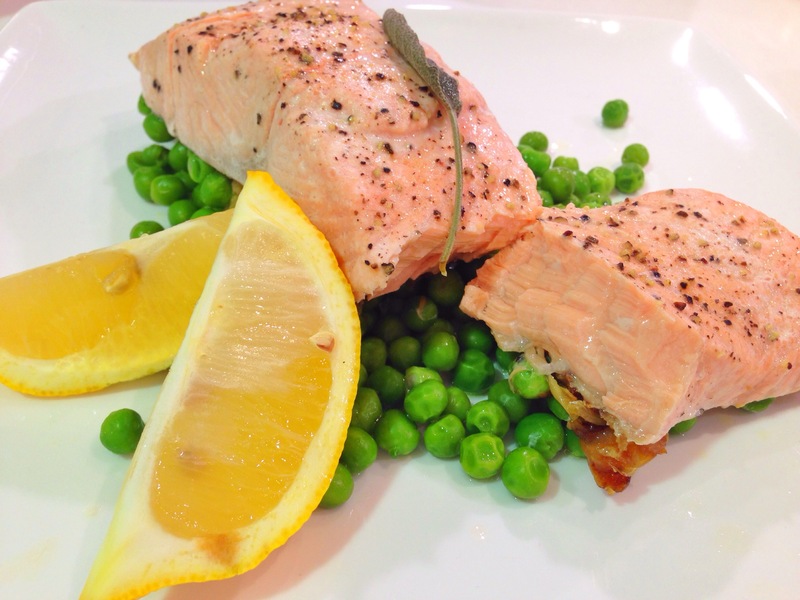 Salmon is full of protein and health fats and peas are carbohydrate rich and full of fibre. Peas have a slight sweetness which compliments salmon. Pre heat combination steam oven/steam oven to full steam 100C. Sprinkle salmon with lemon pepper seasoning, sprinkle peas with salt and pepper. Place peas into a small oven proof dish, place salmon on top, place your choice of herb on top of salmon. Steam for 8minutes, for a medium cooked salmon. These scrumptious little puddings are bursting with flavour. Thankfully, these delicious morsels can be made in a silicone muffin tray which creates the perfect portion for individual serves, keeps our dessert looking elegant to impress our guests, as well as making cleaning easy! I recommend placing your silicone muffin tray (12 hole) onto a baking sheet. This makes it much easier to handle. Slightly stale bread works well as it soaks up a little more of the liquid. 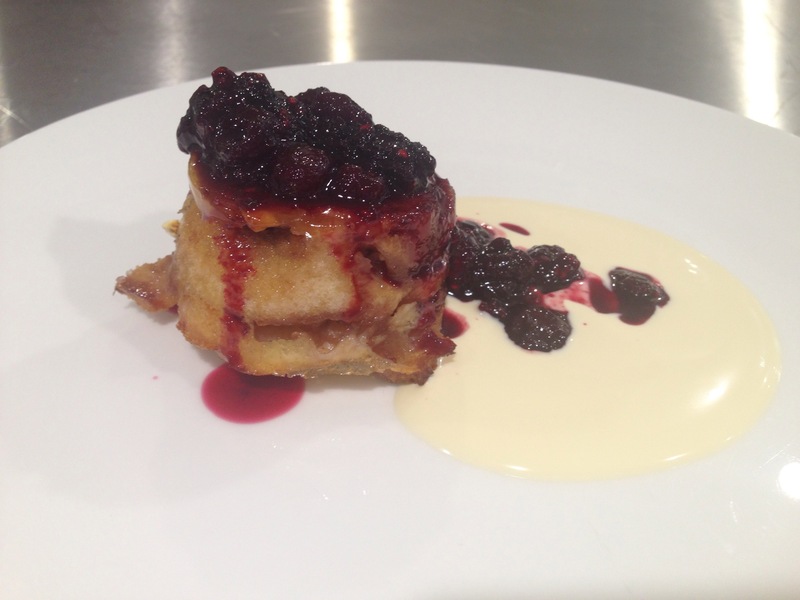 Made from start to finish in 25minutes, this elegant pudding is a sure crowd pleaser. The only variable to be mindful of in the recipe is the size and volume of your muffin pan as you may need to add or reduce some bread. Preheat combination steam oven to quarter steam and heat/25% steam 160C. Remove crusts from bread, lightly press down, spread one side with butter, spread jam on the other side. Cut bread into quarters and arrange bread with the butter side touching the silicone pan, blueberry side facing inwards so that there are no gaps. Gently press the bread together. Place 1tsp of blueberries and 1tsp of white chocolate melts into each muffin tin. Using remaining bread, place jam side down in the centre of the pudding to create a ‘lid’. Mix eggs, cream, vanilla and sugar together, pour over each pudding and allow the liquid to absorb into the pudding for 1-2minutes. Top up each muffin cup if you have space and left over liquid. Place into oven and bake for 12-15minutes. Place blueberries and jam into a small saucepan with 1 ½ cups of water. Place onto a medium heat and bring to a gentle simmer and allow to reduce and thicken. Place white chocolate melts in right before serving and stir to dissolve. Invert puddings. The lid side should be touching the plate. 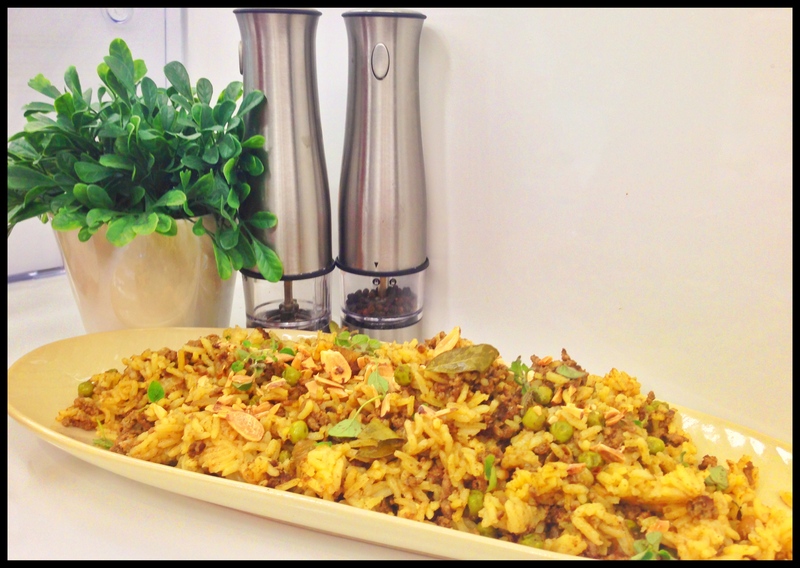 This delicious Middle Eastern inspired dish will set off your senses. Chockfull of delicious and aromatic spices. All the labour is done in the first few minutes, after that the oven takes care of the rest. Best of all it is made in 1 pan, a great balanced meal extra veggies can be added if you like. The fresh curry leaves add a slightly spicy, citrus element to the dish, if you do not have access to fresh curry leaves you can use dry curry leaves, double the amount (6). Preheat combination steam oven/steam oven to full steam. In a medium sized pan, that can go from stove/oven, place chopped onion and vegetable oil, cook on a medium heat for 3-4 minutes until they soften, add garlic and cook for a further 2 minutes. Add ground spices, curry leaf, toss around pan and cook for 2 minutes until fragrant. 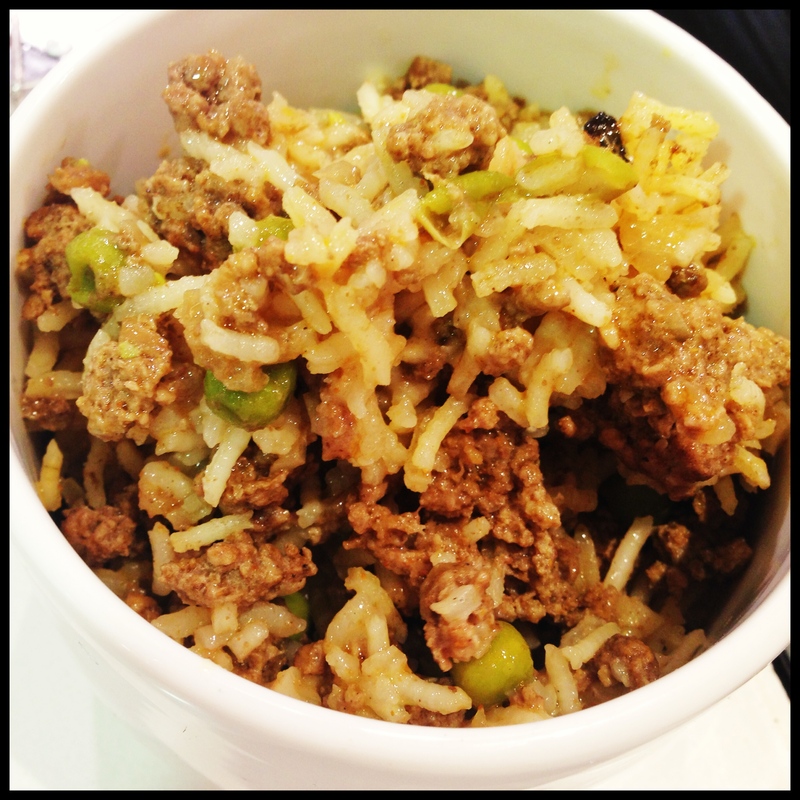 Add beef mince cook for 2 minutes, constantly breaking the meat up, add rice, peas and stir through, the mixture will look very messy, add vegetable stock, sprinkle with salt and pepper, allow to reach a boil while on the stove top. Place into combination steam oven/steam oven and steam for 30minutes. Sprinkle with almonds and coriander and serve. 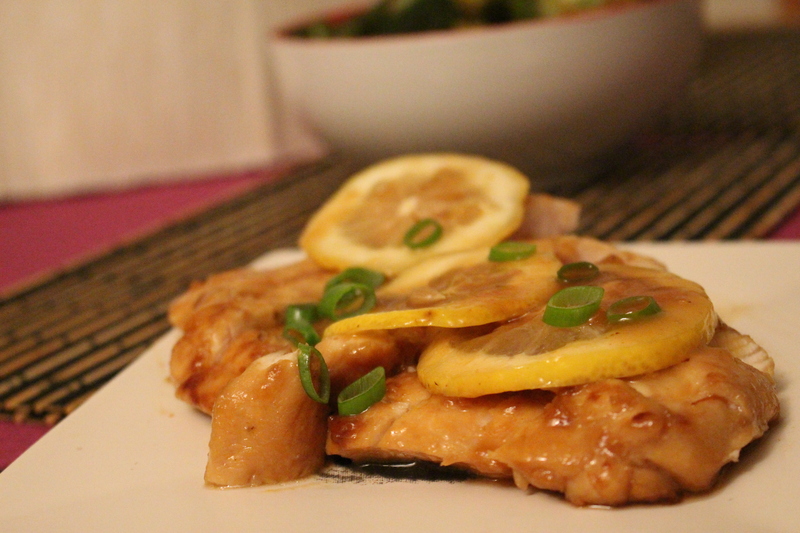 A one pot wonder meal, balanced, flavorsome and the oven does all the hard work ! *note, rice cooking times can vary.